One of cinema's most well known and well loved monsters is back on the screen in yet another reboot. Maintaining the artistic integrity of the original film, long a battle cry against unnecessary sequels/reboots/whatevers, isn't quite the same concern for a franchise that features 30 films, a dozen video games and countless comic books over a 60 year timespan. While I hate the phrase "post 9-11," I suppose the older me views the very realistically depicted destruction in 2014's Godzilla with just a hint of sadness. Giant radioactive mutants are unlikely to wreak havoc on in New York or San Francisco, much less Detroit. But hurricanes might. Or earthquakes. Or another polar vortex. As I type this, my home state of Michigan has active flood watches, while those in California are experiencing extreme drought. 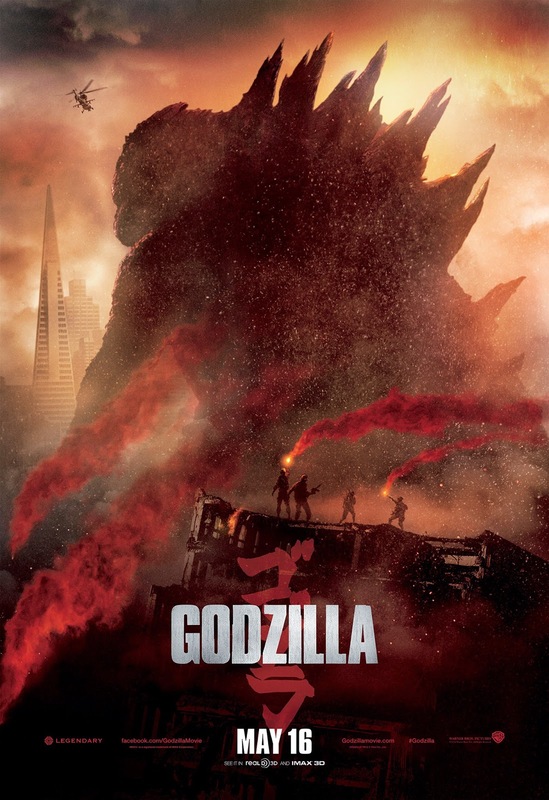 The atomic age concerns of the original, and present day concerns about climate change combine in 2014's Godzilla to provide a somewhat mixed metaphor, but it works overall. And this new incarnation is absolutely expert at suspense, surprise and tension. Director Gareth Edwards nails the lost art of action-adventure films by realizing that it's not all about blowing things up and shaking the camera. Unfortunately, Edwards and screenwriter Max Borenstein must have taken a cue from their childhood selves when it comes to the human elements. Despite a top notch team of players, nearly everyone seems to be some variation of miscast, overacting, underwritten or just plain "not good." It's true that no one comes to big tentpole movies expecting subtly, nuance and depth. But the drama here is flat even by those lax, lax (oh so lax) standards. Bryan Cranston (Total Recall) and Ken Wanatabe (Inception) probably make off as the least embarrassed, though Wanatabe is given nothing to do other than pout in the second half of the film. Elizabeth Olsen's character, despite her profession as a nurse, just kind of wanders around a refugee camp worried, rather than attempting to rescue people. Aaron Taylor-Johnson, ostensibly our lead action hero, is just likable enough not to hate, and just bland enough to be unconcerned with. If the action sequences weren't so somber and realistic (well as realistic as a giant monster can be), one could almost imagine the cast winking into the camera as they run away from the monster. The enjoyment one has while seeing this movie will be in direct proportion to that persons' enjoyment of monster and disaster movies. Godzilla knows what its audience came to see, and it makes good on that premise. It's exciting and entertaining (and just a tad sad) to see Godzilla back on screen smashing buildings. Hopefully Godzilla 2 vs. Pacific Rim gets a second draft on it's human story.